I made these pancakes for my son’s lunch yesterday. Now, if you knew the state of affairs in the morning time at my place (crazy crazy time! ), you will understand the stress under which I clicked these before packing them in the lunch box. Peace reigns the minute after the man and the child leave home for work and school. The house might look as if a hurricane has hit us, but then I am in a much better state of mind to face the day by that time. Yet, the post is a day late and I am posting this in a hurry-burry fashion. 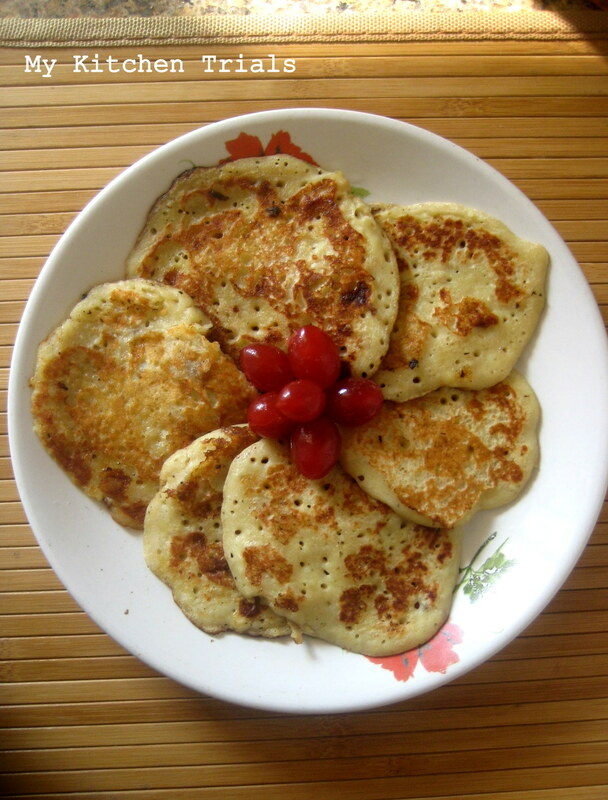 But these Goan style banana pancakes (or so the internet says!) deserve to be enjoyed at leisure. So please relax, get yourself a cup of tea, check out the recipe and savor these! Check out the Blogging Marathon page for more bloggers and more recipes! Mash the bananas in a bowl until no lumps remain. Add the egg and mix with a wooden spoon. Add the sugar, a pinch of salt, milk, flour and cardamom. Mix till it forms a pancake like batter. You can adjust the consistency by adding the milk and flour accordingly. Heat a tawa and add a teaspoon of ghee. When the ghee is hot, pour a ladle ful of batter. Once the bottom side is cooked, flip and cook the top too. Looks yummy….such a nice and simple recipe. Every house is a mad house in the mornings..but surely it is peaceful when the kids and men leave..but what do you do when even you have to leave for work..where is your peace time?…..ha ha..lovely pancakes! yummy ! I do have overripe bananas right now.. but wish these could be made eggless. whatsay Rajani ? Do u think those work without an egg ? and PS : every house is a whirlwind throughout the day, to check out, visit me at any time of the day :D :D … chill and relax.. 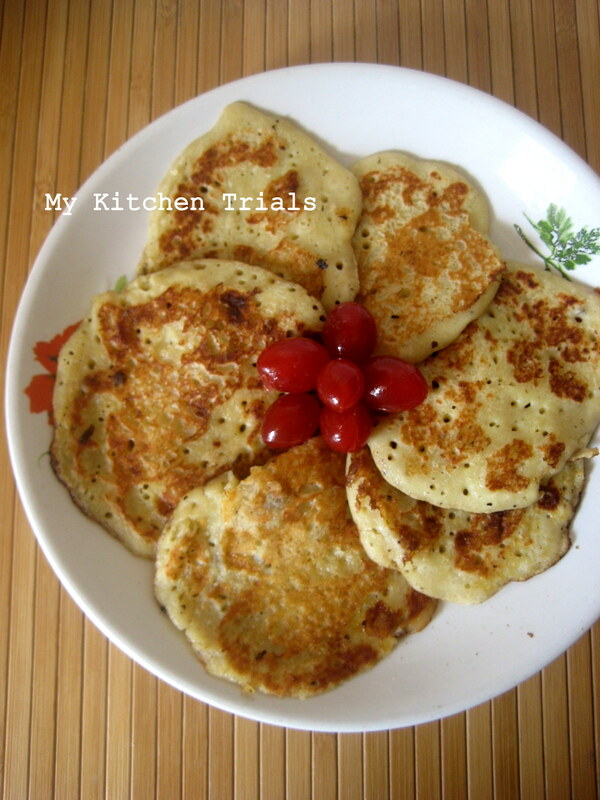 I can surely understand how it must be, when you have to click the box or pack the stuff you make..been there and it’s hard!….I normally make banana pancake without the eggs.. Wonderful fritters to finish out the over ripen bananas, but i thought its might be something deep fried, thanks god its not deep fried. Madhouse in the mornings at my end too!! Good ones..I make them eggless though! looks like perfect breakfast… nice pictures!! I thought they were deep fried going by the title. Didn’t know that Indian cuisine had these fruity pancakes. Sound yummy. These look just like the banana pancakes — love the addition of cardamom.